Hair Trigger was formed in the late months of 2000 and ran in their first tournament in February 2001. Since then we have spent time getting young dogs ready for competition, getting to know one another, having fun and keeping our dogs fit. The future looks promising as many of our green dogs are now racing reliably. The team’s focus is always foremost on having a good time playing with our dogs, but we are happy to step on the podium whenever possible! 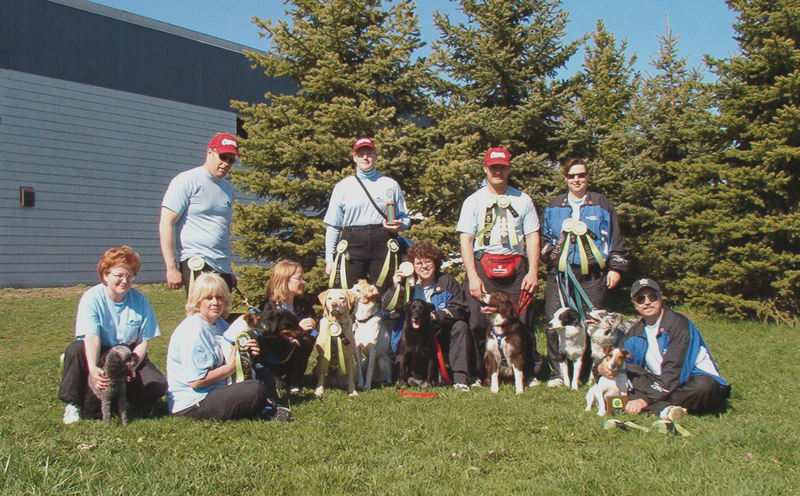 Hair Trigger not only plays flyball, but it is affiliated with the DogSmart Performing Dogs, a group that provides crowd-pleasing shows throughout the area at agricultural fairs and other events. Demonstrations of flyball, agility and obedience done to music highlight the shows, with breed selection and training advice rounding out the fun and educational experience. 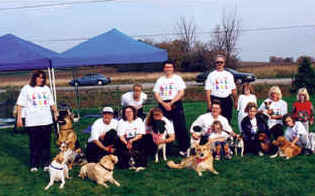 Check out our DogSmart page for a photo gallery of events. 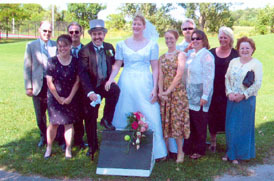 Tracie (our boxloader) and Alan's wedding was scheduled specifically around tournaments in the summer or 2003. "You can take the wedding away from FLYBALL, but you can't take flyball away from the wedding!!!"